Even without being First Lady, Michelle’s story is interesting and valuable. Although she was surrounded by a loving extended family, she still struggled to feel seen and be good enough. With this pressure, she pursued a track through the Ivy League to a coveted job at a Chicago law firm without ever questioning if her goals reflected her values and priorities. After a lengthy reflection period, she took a position in the city government, one of the first propitious “swerves” from her life plan. Throughout her career, she had to struggle to balance motherhood and her work; she also had to figure out how to make peace with Barack’s political career. Becoming also recounts her love story with Barack Obama, another swerve—they met when he was a summer associate at her law firm and she was his mentor. Not only did she think the relationship might be inappropriate, not only was she focused on her job and uninterested in dating—Barack smoked! Still, they fell in love. I enjoyed seeing Barack through her eyes. It only confirmed my positive impression of him. As much as she loves him, though, she revealed personal details about their relationship: a miscarriage, fertility struggles, and marriage counseling. Once Malia and Sasha were born, Michelle struggled to balance her work and parenthood, especially since Barack was so often away due to his responsibilities as a state representative in Springfield, Illinois, then as a U.S. Senator in Washington, DC. Michelle honestly conveys the challenges which only increased once Barack ran for and became President. The girls didn’t ask to be in the public eye: how could Michelle and Barack keep things as grounded as possible for them? Michelle also tells about her experience campaigning for Barack, particularly in Iowa, and how hurtful it was for both her and Barack to be the target of attacks, many racially based and which didn’t end once they moved to the White House. She reveals her stumbles on the campaign trail and discusses how “optics” ruled her words and behavior. Although Barack and Michelle didn’t accomplish all they wanted, and although the Trump administration is malevolently undoing all the positive gains they made, she writes proudly of what they did achieve. Furthermore, though it is clear she dislikes Trump as a leader and as a misogynistic racist, she is much more reserved with her criticisms than I would be. It’s been widely reported that she wrote she’d never forgive Trump for his role in the birther controversy. What she said was more subtle than that. It wasn’t simply Trump’s unfounded attacks on Barack’s citizenship that angered her. It was the fact that those attacks stoked the fears of individuals who had every capability of traveling to Washington DC to harm Barack, her, or the girls. She said she could never forgive Trump for putting her family in danger, and I don’t blame her. I learned so much from this book not just about Michelle and the Obamas, but about experience as a minority on a mostly white Ivy League campus, about strategies for advocating for oneself and finding one’s voice, and about life behind the scenes on the campaign trail and in the White House. Her insights and anecdotes were so interesting and rooted in history and current events. When talking about her family, she offers insight into the Great Migration and the discrimination blacks faced in Chicago in the segregation era, for example, being barred from holding union cards which kept them from skilled jobs. Her discussions of gun violence and education for girls are accompanied by current statistics and trends. I though the three-part structure of the book was clever, and Michelle weaved in the theme of becoming, stressing it’s a never-ending process. Although I loved reading about Barack’s presidency and Michelle’s FLOTUS initiatives, I thought the first half of the book, when she discusses her childhood and her life a Princeton, was stronger. Those sections seemed more coherent and polished. The information in the second half of the book was fascinating (meeting the Queen! hanging out with Bo and Sunny!) but seemed slightly disorganized and rushed. On the one hand, it’s understandable—there is just too much information to fill one volume. On the other, maybe it shouldn’t have been a single book so that the material could have been given more attention. But this is a relatively small quibble for a strong, well-written, and insightful autobiography. Multiple times I wept, sometimes with Michelle as she describes painful past events, sometimes in grief at how much I miss the Obamas and the intelligence and compassion they brought to the Presidency. I was incredibly impressed with her candor, especially since she must know the extent to which her words will be dissected and criticized. Yet, I can’t imagine a woman who wouldn’t be able to see herself in Michelle, because of her childhood, poor in resources but rich in love, her job in male-dominated profession, her drive to seek work-life balance, her struggles with fertility, and her desire to find a career that conforms to her values and makes a difference while still paying the bills. Of course, she also speaks eloquently about being black in America. Those who like Michelle Obama will like her even more after reading Becoming. Political opponents will only find superficial fodder to attack her and Barack. If you are in the former category, you will definitely want to read (or listen to) the book. In the story, Steve Inskeep provided a clip of an interview from Tina Graham, a Virginian and Democrat who doesn’t support McCain but also doesn’t think she can bring herself to vote for Obama. Hey, Tina, the question is answered. Guess what? You are a racist! Thanks for playing. In an AP-Yahoo News survey of pet owners, McCain, who has a number of animals, was preferred by 42 percent of respondents, while Obama received endorsements from only 37%. I have to admit that Obama’s lack of a pet bothered me before I had decided whom to support in the primaries, but ultimately, decided that it was his position on animal issues that was more important. The Humane Society Legislative Fund regularly publishes scorecards assessing legislators’ position on animal-related issues. Obama took pro-animal positions on horse slaughter, animal fighting, and funding for enforcement of a number of laws. He received a score of 75. McCain, on the other hand, received a score of 25; his only pro-animal position was on horse slaughter. Animal lovers, feel confident in supporting Obama. He may not have companion animals of his own, but he is a friend to animals. Ithaca is commonly listed among the most culturally liberal of American small cities. The Utne Reader named Ithaca “America’s most enlightened town” in 1997. According to ePodunk’s Gay Index, Ithaca has a score of 231, versus a national average score of 100. Like many small college towns, Ithaca has also received accolades for having a high overall quality of life. In 2004, Cities Ranked and Rated named Ithaca the best “emerging city” to live in the United States. In 2006, the Internet realty website “Relocate America” named Ithaca the fourth best city in the country to relocate to. In July 2006, Ithaca was listed as one of the “12 Hippest Hometowns for Vegetarians” by VegNews Magazine and chosen by Mother Earth News as one of the “12 Great Places You’ve Never Heard Of. In the New York Democratic Primary, Obama won one county in New York–Tompkins (Newsweek coverage). Can’t imagine a place being more ideal for me. I have a little too much time on my hands right now. Sure, I could be using it to productive ends, but I figure this is the one month that I can really relax. As soon as I move, I will be in new professor mode. Lately, I’ve been spending lots of time on the computer. 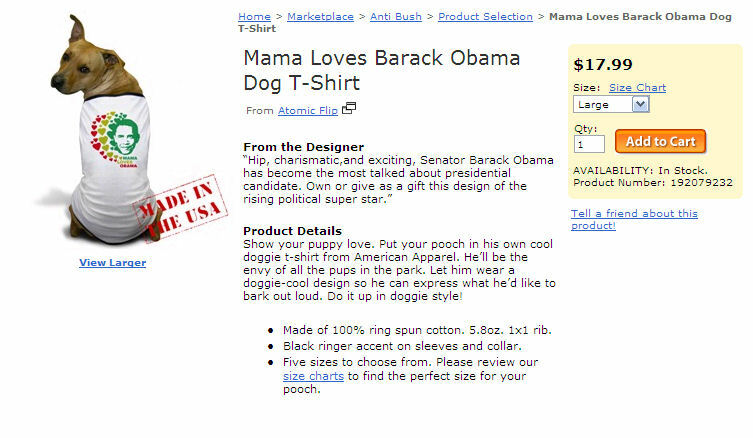 One night, I thought I’d browse dog t-shirts with Obama slogans. Since I have no cash, it was purely an academic exercise, but I thought these “Mama Loves Obama” tees on Cafe Press were cute. So perfect for Walter! During this search, a lot of other Obama slogans came up, one of them being “Barack My World.” It makes me laugh every time it comes to mind.